338 items in this album on 17 pages. Eastern side of Mount Suribachi prior to US invasion, Iwo Jima, early 1945 Lieutenant Wade spoke to his men at a pre-invasion briefing, early Feb 1945 SB2C-4 Helldivers of Bombing Squadron VB-9 returning to the USS Lexington (Essex-class) after a strike in support of the US Marines on Iwo Jima, Bonin Islands, Feb 1945. 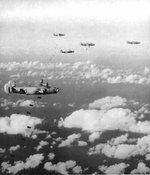 B-24J Liberator “Vera L” and other aircraft from the 27th Bomb Squadron drop 55-gallon drums filled with gasoline on Iwo Jima to burn off the plant growth in advance of the landings to come two weeks later, Feb 1 1945.